Rated as one of the best views of inland South Africa, Adamsiew offers Luxury and standard self catering accommodation with breathtaking views over Gariep Dam. Situated halfway between Johannesburg and Cape Town you will find Adamsview 5 km from the N1 close to Colesberg. Self Catering in the Luxury units. Luxury accommodation with a view to die for at reasonable rates. 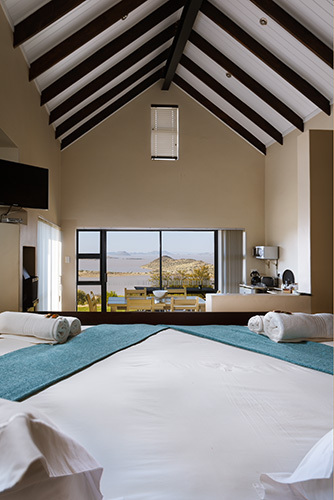 The Gariep Dam view can be seen from bed, bath, Spa baths, fire place, kitchen, baai and garden area. Rated as one of the best views of inland South Africa. Peace and quiet that can only be experienced in the Karoo. 5Km from N1 and about 40km to Colesberg. If you want to relax, this is the place to be. Adamsview the place to be. You will enjoy your stay at Adamsview with its breathtaking views over the biggest dam in South Africa.